It’s the Australia Day long weekend and for most people in Australia it involves a dip in the ocean or a backyard pool which means a good pair of swimmers, togs, bathers, cossies (or whatever you call them) is essential. Or if you live in the northern hemisphere, it’s the time you start planning an escape to somewhere warmer which also means you need swimwear. 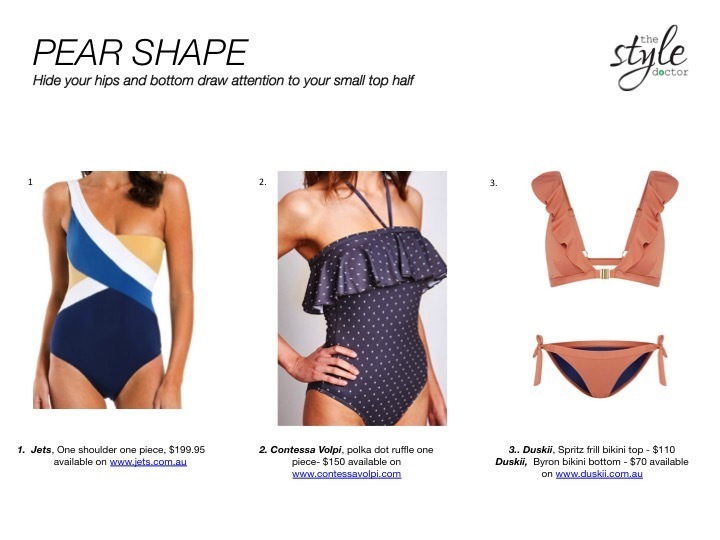 Swimwear shopping can be daunting so I have put together a guide to help you find the perfect swimmers for your shape and to show you what's available in stores and online. If you really can’t stand trying them on in the store then choose an online store with a good returns policy so you can try them on in the comfort of your own home. Our biggest tip when deciding on your swimwear is to be honest with yourself and your shape and this will help you find your perfect style. Also our advice to women is don’t feel pressured to wear a bikini, there are plenty of great one pieces these days that may be more flattering on your shape but if you still have the body to rock a string bikini then we say go for it! Your body shape is very up and down with little waist definition so try and create some curves with lines and prints as well as padding or frills on the bust. Your bust and waistline is smaller than your hips and bottom where you carry most of your weight. You want to draw your eye up with prints and detail at the top or even a plunging neckline to draw attention away from your large bottom. A top with padding or frills is also a great way of balancing out the top with the bottom half. Another option is to do darker bottoms and a bright or printed top or more colour at the top of the swimsuit if it’s a one piece. Also if you are buying a bikini, in most cases you are a smaller size up top to your bottom so make sure you can buy them separately and you don’t end up having a top that fits and bottoms that are bursting at the seams or bottoms that fit and a top that’s too loose. When you have a large bust and carry your weight through your middle then swimmers that disguise your middle area work best. You will also need a top with underwire or thicker material to give you the support you need. 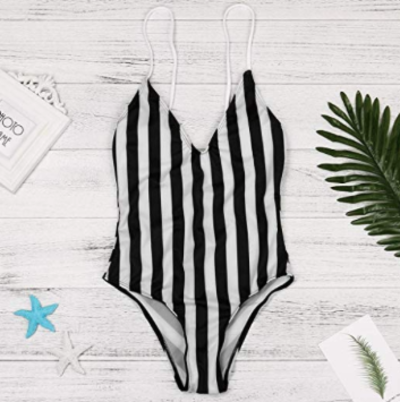 If you carry most of your weight in your lower tummy then you can opt for a high waisted bikini, however if you carry the weight in the middle of your tummy then you will need to opt for a one piece. One pieces with roughing or a gathered look to detract from your lumps and bumps work best. You will most likely be the envy of everyone on the beach because the hourglass figure can wear almost any type of swimmers from bikinis to one pieces, to high cut, low cut and strings- you are lucky you can wear them all. If your bust is on the large side, make sure you have the support and if your tummy is not as toned then opt for a one piece. Since you have a larger bust, you will need swimmers with support and unfortunately the string bikinis won’t give you that support anymore. You also want to enhance your curves and minimise the problem areas. Thank goodness there are some stylish swimmers for plus size now and not just the ‘granny’ swimmers. There are a lot of young plus size women who want to look stylish at the beach too. If you're petite, 2 pieces are better because one pieces are harder to fit on the body. You're lucky that your smaller frame will suit most 2 piece styles. In Australia the sun is getting stronger and stronger so if you are out surfing, paddle boarding or you know you will be in the sun for a long time then these options will protect you from the sun. If you're on a budget there is a great site that have cheap one pieces and bikinis- visit Amazon Fashion Australia. I found this striped RJDJ one piece which would suit most shapes and is only $7.50 - what a bargain!!!!! If you need further style medicine then the Style Doctors are always here to help. If you’re not sure what shape you are then take our Style Report today.